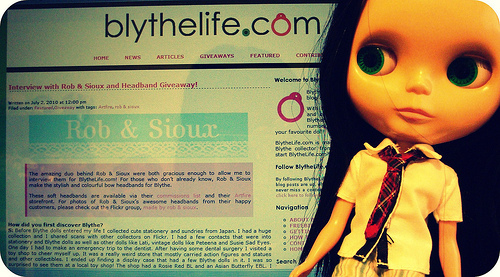 BlytheLife.com » Get Featured on BlytheLife! I’m all about giving back to the doll community when possible, and part of that involves celebrating you and what you do here on BlytheLife. I love interviewing people in the Blythe community – ranging for seamstresses for our favourite fashionistas, knitters and crocheters, customizers, and all-around amazing people. I’ve interviewed a grand variety of people in the community, and would like to feature you as well! If you’re interested (or want to gently prod someone my way), check out the page about Getting Featured. If you do something else for Blythe that hasn’t been mentioned, I still want to interview you! I love getting to do interviews. If you run a shop online where you sell things for Blythe, and you happen to have a sale, be sure to submit it to Shopping Saturday! If you submit it, I will post it and share your sale with all of my readers.